We went on a little fishing trip for a few days and this was our catch. 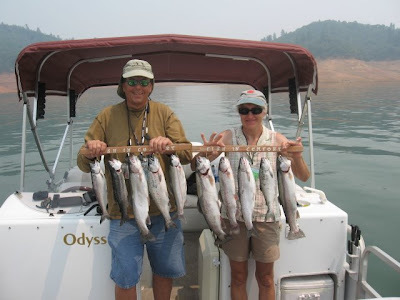 We went to Shasta and had a very nice and knowledgeable fishing guide take us out on his boat to all the hot spots. The lake was very low, but the fish were still there. There have been several fires in the area caused by lightning strikes so there was a lot of smoke still hanging around. You couldn't even see Mt. Shasta through all the smoke. Michael will be writing more about this on his fishing blog. He learned a lot of fishing tips from our guide, Ben. Some he'll share and some he will keep to himself. 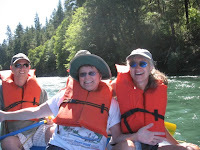 We went from there to my Dad's in Shady Cove, Oregon where we all went on a rafting trip down the Rogue River. What a fun filled 3 days! We came back to gardens full of tomatoes and basil. 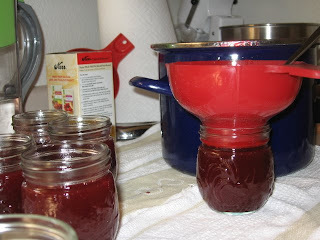 We have been busy making sauce and pesto! Okay I am not moving very quickly on this project with all the watering to do at the nursery and in my garden it is sometimes hard to look at a watering can. It has been over 100 degrees for the last few days and looks like we have a few more to endure. The heat has made me a little too tired to sew, but I did manage to do a little the other day. 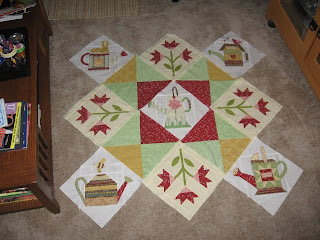 This project is so fun and as usual for me I always try to improvise a little and make the design a little more my own even though for the most part I am following a pattern. I spent a lot of time deciding on the fabrics for the next step and am happy to say that I have still not had to purchase any fabric for this project it has all come from my stash. That has been part of the fun. The tiny yellow gingham was something I used when I had my first baby and I made a little quilt for him and also made some velcro diapers that I ended up using for burp cloths instead. That first baby of mine is about to turn 24 so just goes to show if you keep long enough you will eventually use it (or at least some of it). I don't have a felt board to lay my pieces out on so I use my carpet. It was sure fun laying out what I have so far and seeing how it will actually come together. I know, the picture is not very good, but it shows enough of how it is coming along. I still have no idea what I will use this for, but I really don't care because the project has been so enjoyable. I am making a lot of changes in the colors here from what the pattern called for and I am quite happy with my choices so far. One thing I have tried to do to tie it all together is to use the red fabric in each step in some way. 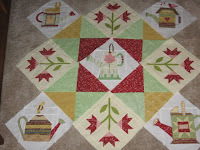 Sometimes it is a little bit and sometimes it is something big, like the flowers in the flower blocks. I am thinking of using the red for the inner border and the binding too and who knows if I can find more fabric I might use it for the back too...only that may be too much red. The red fabric is Magic Vine by Eleanor Burns. I went to her web site to get some more though and it is sold out. I had bought it on sale a few months ago so I hope that doesn't mean it will be hard to find now. Guess it is time to do more of the Fab Shop Hop and see if I can find it in one of those stores. I am finding that I am buying more and more fabric online than in fabric stores these days and I have been really pleases with the results. If you have air conditioning and like to look at fabrics or just enjoy looking for bunnies be sure to check into the Fab Shop Hop and see if you can win a sewing machine! It is a fun way to pass time and do a little shopping at the same time. Stay Cool and enjoy summer in your own way! 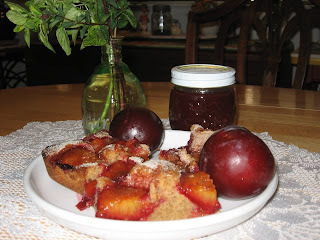 Today Michael made Hungarian Plum Cake with the plums. It was delicious! I have waited for this cake for a whole year and it was worth the wait. 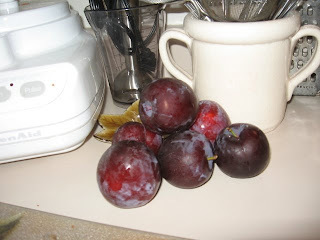 I am going to share this recipe for anyone who might have a few extra plums around. This recipe came from Michael's Hungarian Grandmother and he insists that you must use Crisco to get the right texture. He used the butter flavored Crisco this time and it worked very well. Fold into batter. Spread into a greased cake pan (6X11X2). 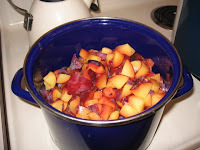 Cut plums in half and press into batter until it is covered, about 6-8 plums. 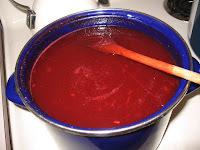 Sprinkle with topping of 1/4 C. sugar mixed with 1 Tbsp. Cinnamon (reserve some for finishing touch). Bake at 400 degrees for 30-35 minutes. Sprinkle with reserved sugar/cinnamon after removing from the oven.